One Point = One Dollar! Spend points for service or sales back here at the Dealership! Online one account per household necessary! Click "Shop Now" button on your personal Rewards website located on teh back of your card to start shopping! Rewards+Plus points are good for 2 years. Used for service work and towards the purchase of your next vehicle! Service dollars earned can be spent on future service work. Sales dollars can be spent towards your next vehicle purchase. Track your points and shop through your personal Rewards website! Yes, we love to take care of your Nissan. WHAT IS THE COST TO ENROLL? The One to One Rewards program card costs you nothing. It is our way of rewarding our best customers at Lithia Nissan of Fresno! HOW CAN I EARN POINTS AT Lithia Nissan of Fresno? When you enroll in this program, we will pre-load your card with sales and service points. Every time you have a customer-pay transaction at Lithia Nissan of Fresno you will earn a percentage of your purchase back on your card. You can use your purchase points on your next Lithia Nissan of Fresno visit. ARE THERE OTHER OPPORTUNITIES TO EARN POINTS? Your rewards card allows you to shop at over 300 leading retailers (online only) where each purchase earns you bonus points that can only be used at Lithia Nissan of Fresno. 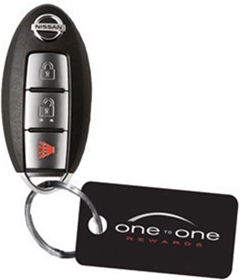 To start shopping log in at www.nissanonetoonerewards.com and click on the "Rewards+Plus" button. View all discounts and special offers and START SHOPPING! Your points will automatically post to your account 30-45 days from shipment of your online purchase. It really is that easy! IS THERE A CATCH? Not at all! The One to One Rewards program card is our way of saying thank you for being a loyal member of the Lithia Nissan of Fresno family. We value your business and thank you for your buying confidence! WHERE CAN I SHOP? We have partnered with hundreds of big name retailers such as Best Buy, Target, Barnes & Nobles, etc. Shop online at one of our partners through your Nissan One to One Rewards account and receive owner points toward your Nissan. Let those points build up and use them at our dealership. If you were going to shop at those stores anyway, you might as well get rewards for your vehicle! HOW DO I MONITOR MY POINTS? We keep track of your reward earnings each time you visit . 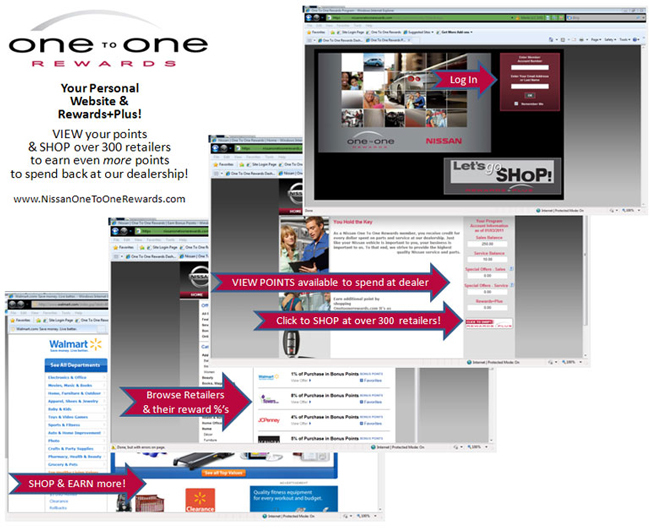 You are also able to track your points by logging on to www.nissanonetoonerewards.com.